Expand your artistic capabilities using a phenomenal collection of the world's most realistic digital Natural-Media. The Top Choice in Painting Software by Artists Worldwide! Launch a refreshing and transformed user interface to reveal a darker theme, allowing your painting process to take center stage. Corel corrected a few imperfections that may have inhibited your full creative potential, freeing you to seamlessly execute your vision. Thanks to enhanced support for multi-core processors and CPUs that use AVX2 extensions and extensive code optimizations, this is the fastest version of Painter yet. Windows multi-touch pan, zoom and rotate is a breeze. Wacom tablet painting and navigating is a dream. And Corel Painter 2019 will support your .PSD files. Imagine kicking off your creative exploration with over 900 inspiring brushes. This latest version includes 36 NEW and diverse brushes plus the world’s most realistic Natural-Media® and exclusive Particles, Pattern Pens, Thick Paint brushes and so much more! These Painter brush variants are so popular Corel has further expanded the category to include six exciting new brushes. Paint with rich brushstrokes that will enliven your canvas. Launch a refreshing, professional interface that makes your artwork the focus. 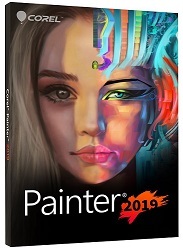 Corel has meticulously transformed the main user interface elements in Painter 2019 to reveal a darker theme that allows the interface to melt away and painting to take center stage. An Enormous Amount of Brushes! Dramatically improves your system's responsiveness with incredible boot, loading, and transfer times! Work faster with unbeatable 64-bit performance and an array of features for print and digital production.